NLP techniques change behavior by modifying internal representations to aid the attainment of desired goals. Both TI swimmers and coaches have significant roles in practicing the four NLP patterns of behavior. Bedause of experience TI is better positioned than individuals for teaching the internal representations that will improve swimming behaviors. My internal representations include both visual impressions and Terry’s phrases like, “Yield to the water”, “Feather feel”, etc. “Ease” has a rather abstract meaning. That stroke thought might not be generally effective, because of the wide variation in skill levels, andinternal representations of swimmers who hear it. I’m looking forward to ever more interesting internal representations to consider, and methods to modify them, that flow from the Kaizen thinkers at TI headquarters. This virtually guarantees you will swim harder. It’s nowhere near as certain that you’ll swim better. 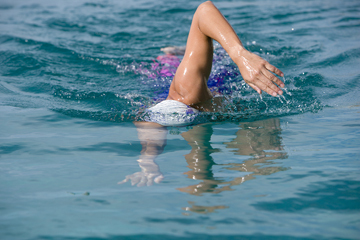 As Amy noted in an earlier post, a likely side effect of an intention to “Swim Hard” is that you’ll increase muscle tension. And that will hurt your effectiveness. So for TI to position EASE as a foundational goal is important in changing concepts. Get your legs to “draft behind” your torso. Those are just instructions on “mechanical” ease. In addition, we have a whole range of instructions for “strategic” ease, such as “how to swim faster”: (1) Focus on sustainability, not velocity. (2) Reduce the resistive force of the water before increasing the propulsive force you generate. (3) Work the “math” of speed – building “neural circuits” for high-skilled combinations of SL and SR – rather than heedlessly churning your limbs faster. And finally there are “illustrations of ease” such as the image below of Shinji, from the Outside the Box video shoot demonstrating the Marionette Arm. I am a 54 yr old triathlete. 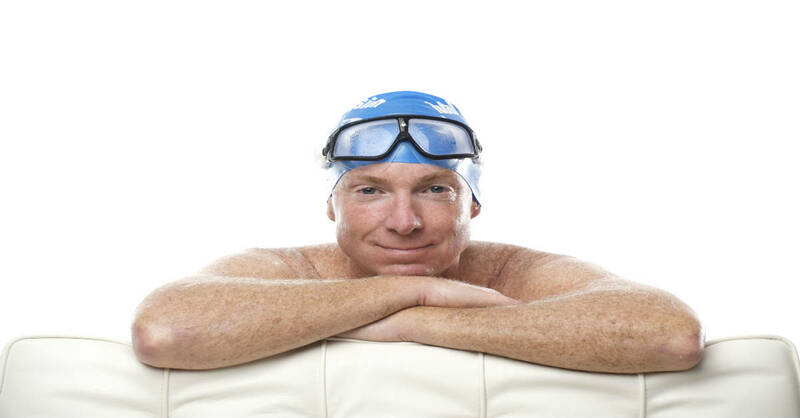 I have the book and the DVD….I have spent the last 6 months working on my TI technique…..using a slow “catch-up” style stroke I can make a 25 m length in 14 strokes consistently (For 50m, I can do 28 strokes + 66 Secs = 94). It’s working! However, I am struggling with getting the timing of a faster stroke. As soon as I speed up my stroke, my technique falters and I seem to be stuck in a catch-up style stroke. I can’t seem to get the timing of a quicker stroke….any thoughts. I haven’t given up. I wrote the book 15 years ago and have learned a lot since. Just as it has been my goal to be continuously improving in my swimming so has it to be Kaizen in our teacher. So much about our instruction has evolved since the early days of TI. In the case of that language, I didn’t mean to literally swim ON your side. I meant to rotate and to avoid swimming ON your stomach. So now we say swim OFF your stomach because that degree of rotation is sufficient. What do you mean by nudge your hip? A very light movement of the hip. The emphasis is still on initiating power and propulsion from the core, rather than the arms, but with controlled rotation and trying to minimize the power output. Great blog! I’ve been going thru some of the links. Communicating with Fiona to work out a private small group session soon. I have the book and DVDs, and try to do it on my own, but I tend to do best when shown and guided so hope that a session with Fiona will get me on the right track!